Today is National Astronomy Day! 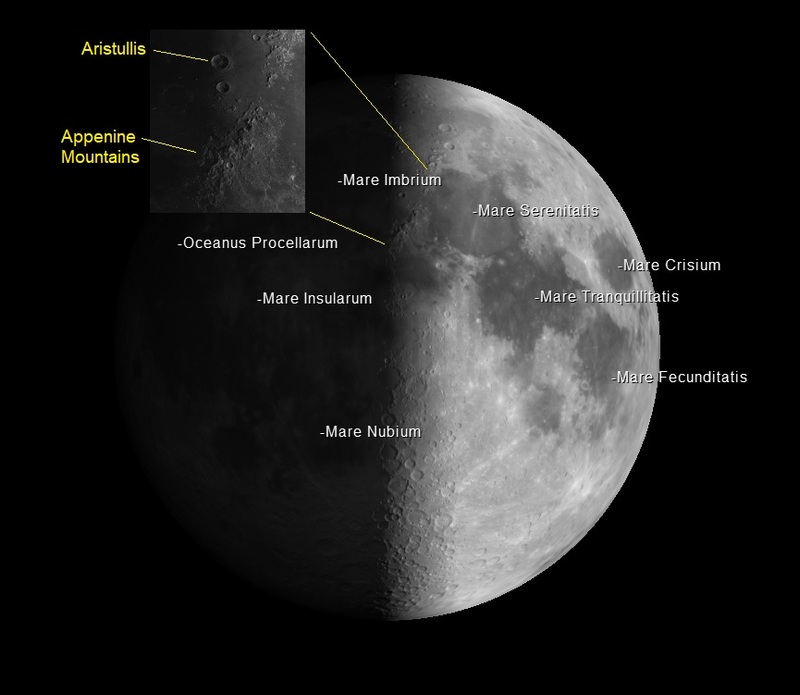 The Moon: will be 55° high in the SW at 9pm, and 50% illuminated (First Quarter phase). The region of interest for tonight is the western side of Mare Imbrium, in particular the crater Aristullis and the lunar Appenine Mountains. Aristillus is 34 miles in diameter and 2.2 miles deep with a ray system extending over 370 miles, and is paired with the smaller crater Autolycus just to the south. A litter further south are the lunar Appenine Mountains, named after a mountain range in Italy, their highest elevation is 17,700 feet. This is also the landing site of the Apollo 15 mission. Planets: there will not be any planets visible tonight. 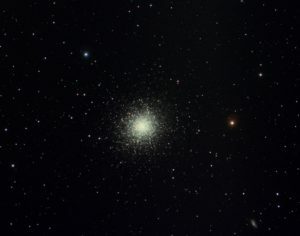 Deep-sky Objects: One of the brightest globular star clusters is M13 , 47° high in the East by 10:30pm. This cluster may show well in a telescope tonight despite the brightness of the Moon, because it’s on the opposite side of the sky. M13 is about 25,000 light years away in the constellation Hercules, and contains about 300,000 stars. There are about 250 globular clusters in orbit around the center of the Milky Way. Photo below by an ASGH member.